Largehearted Boy: Book Notes - Dominic Smith "The Last Painting of Sara de Vos"
Book Notes - Dominic Smith "The Last Painting of Sara de Vos"
Dominic Smith's novel The Last Painting of Sara de Vosis a captivating art world epic that spans continents and centuries. "Smith’s latest novel is a rich and detailed story that connects a 17th-century Dutch painting to its 20th-century American owner and the lonely but fervent art student who makes the life-changing decision to forge it. This is a beautiful, patient, and timeless book, one that builds upon centuries and shows how the smallest choices—like the chosen mix for yellow paint—can be the definitive markings of an entire life." At the center of my new novel, The Last Painting of Sara de Vos, is a rare 17th-century Dutch landscape. We follow it through time, looking at the way it changes the course of three different lives, in three different centuries. 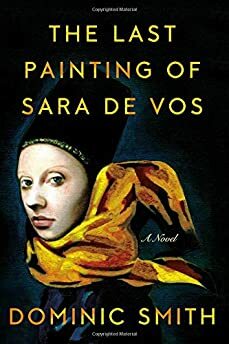 We see the circumstances under which Sara de Vos paints it in 1630s Amsterdam, and the 1950s life of the wealthy Manhattan lawyer who inherits the painting, then has it stolen. We also witness half a century in the life of an Australian art historian who was paid to make a copy of the landscape in her twenties. Now, in 2000, in the prime of her illustrious career, both her forgery and the original show up for a Sydney exhibition she's curating on Dutch woman painters of the Golden Age. While the Dutch Golden Age sparked a deluge of prolific painters, the same can't be said for classical composers. There aren't really any Golden Age Dutch composers to rival the Germans or the Italians. Nonetheless, music was everywhere in 17th-century Holland—in taverns and music halls, and in the music rooms of the wealthy. Pinksterliedje – "Song of the Whitsun Flower"
One of my main characters, Marty de Groot, is a jazz enthusiast who regularly goes out to a basement club in Manhattan of the 1950s. He recalls seeing Charlie Parker play in an earlier time and regrets that he abandoned the trumpet in high school, that he never explored his own musical potential. This tune is shifting and unpredictable, just like Marty de Groot's life after he discovers that someone has swapped out the iconic landscape painting above his bed with a meticulous fake. Gary Giddins, who wrote a book celebrating Parker, said of this tune: “It's like a ping-pong ball being blown by a fan in a very small room, where he changes the accents on every measure, on every phrase.” The same could be said for this period of Marty de Groot's life. Recorded in 1959 but released in 1960 on an album of the same name, this jazz tune feels like it ends one era and begins another. It's a study in change and progression. By the end of the 1950s, two of my characters, Marty de Groot and Ellie Shipley, have burned certain bridges with the past but they're also tied to it in a deep and abiding way. Jazz has always felt like that to me—something new emerges but it is inextricably tied to what's come before. Paul Kelly's "Before Too Long"
This is nominally a love song, but I've always found something unsettling in the lyrics: Before too long/He who is nothing/Will suddenly come into view. When Ellie Shipley's past comes back to haunt her in Sydney in 2000—as the city embraces the world stage with the Olympics—it's like a wrecking ball coming through the side of a house. Hoodoo Gurus' "What's My Scene"
When I was in high school in Sydney during the late 1980s, this song hit the charts. There's a line that perfectly evokes Ellie Shipley's fundamental dilemma throughout her life—I've been caught in someone else's scene (but that's not me). She's someone who's never quite found where she fits in, whether in New York, London or Sydney. That restlessness and searching quality is a core part of her character. I also love the fact that this song has two different choruses—a stylistic flourish that Ellie would appreciate given her training as an artist and historian.